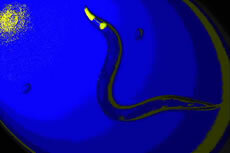 Caenorhabditis elegans is a nematode (sometimes called a roundworm) that eats soil bacteria. It is also common on the surface of mushrooms and in compost piles. The adult in the above picture is 1.5mm long, Wild type individuals are colorless, but this mutant expresses a green fluorescent protein in the musculature of its pharynx (used for eating), which shows up as yellow in this manipulated photograph. The two oval objects are eggs. As is the norm for C. elegans, this adult is a hermaphrodite, capable of fertilizing her own eggs internally. Life, as we eventually find out, is unpredictable. Our successes often depend as much on being in the right place at the right time as they do on our personal attributes. Should the lives of other organisms be any different? Populations in nature experience different conditions from place to place and from time. The result is that local fitness, that is, the tendency for individuals' genes to survive through the generations, is to some degree unpredictable. This is particularly true when we consider only those patches of habitat that are, on average, equal in quality and suitability for an organism. Though an individual might be expected to survive and reproduce with the same probability in any suitable patch, random variation in each patch through time makes it difficult for the individual to predict whether its performance will meet, exceed, or fall short of that expectation. How can organisms deal with a fickle world? Waiting, if you can do it, is a great way to deal with the unpredictability of life. I once got a fortune cookie that read, "Sometimes the wisest decision is not to decide." Many species have special physiological strategies, such as diapause and seed dormancy, that allow them to wait through bad years and make a go of it when they sense the signs of a good year. Waiting, however, is not the only way to deal with environmental fluctuations. In fact, if the environment is prone to abrupt, severe local disturbance, such as fires, floods, or pest outbreaks, it may be better to leave rather than wait. If the disturbance is unpredictable and might happen anywhere an organism travels, then the organism is faced with just the same problem as the gambler at the roullette wheel. Put all your money on one number and you might lose it all very quickly. For you, it's the end of a night on the town. For the organism, it's the end of its genetic line. Just as the gambler might spread bets to minimize the risk of going broke, natural selection might favor behaviors or morphologies that result in the distribution of offspring over multiple patches every generation. The evolution of dispersal in a finite set of extinction-prone patches. Two genotypes compete in Petri dishes containing a number of either large or small patches of bacteria (food). One genotype produces more offspring and the other is a better disperser. On this graph, points below the dotted line represent situations that favor the more fecund worm. Notice that, regardless of the number or size of patches, the more fecund worm was favored in microcosms without extinction. With random patch extinctions, the better disperser was favored in sets of two patches but not in sets of eight. The effect of extinctions was greater in small than in large patches. These results suggest that reduction in the number, stability, and size of habitat patches can lead to an evolutionary response in an organism's life history. Theory on the evolution of dispersal has come up with many explanations for dispersal. Dispersal reduces competition among kin. Dispersal reduces competition between parents and offspring. Dispersal reduces inbreeding. Dispersal is a reaction to local overcrowding. The list is rather long. And why not? Dispersal is a ubiquitous life history event. Surely more than one mechanism will act on any population. I have focused my research on dispersal as a bet hedging strategy. The problem with all his theory is that it's so hard to track individuals and figure out just why they each succeed or fail that few hypotheses concerning the evolution of dispersal have been tested. Think about it. You'd need to be God to control the fate of all the individuals in a natural population to such a degree that you could determine, over many generations, that those with a heritable tendency to disperse more increased in frequency for no other reason than that they are more vagile. Fortunately, geneticists and developmenal biologists have developed a large bag of tricks for the study of a tiny soil worm called Caenorhabditis elegans. This nematode makes the news every few months for having its genome sequenced, for carrying homologs to human genes, for having mutations that double its life span, and for surviving the last shuttle disaster. Some of the first mutant strains to be cultivated in this model organism differed from the wild type in their movement behavior. These days, an evolutionary ecologist has only to page through the C. elegans Server and contanct the Caenorhabditis Genetics Center to find genotypes of the worm that might differ in their propensity to disperse among patches of food on a Petri plate. The fate of local populations can then easily be manipulated easily under otherwise controlled conditions.